People born specifically on the 30th of January are bestowed with all the self reliance and assurance of a typical Aquarian. However the astrological planet that rules this particular day is Jupiter giving you a strong sense of purpose and your natural leadership qualities. If you have this birthday you are equitable, intellectual and shrewd and may be a bit of a workaholic. You are an excellent communicator who has a charming and highly persuasive manner but like other water bearer's you shy away from romance. While you are fairly sociable with a witty sense of humor you are also a person who values their privacy. Individual's with a January the thirtieth birthday often have unique ideas that are way ahead of their time and are seemingly too serious natured but in reality are usually lots of fun. Although you may ask others for advice over decisions or ways forward you are inclined to just stick to your initial instincts anyway. Work areas attractive to a person born on the thirtieth of January do not always include occupations requiring leader or management skills. You tend to prefer jobs where these attributes are not a necessity even though you are more than capable of this kind of responsibility. Individuals with this specific birth date like imparting ideas and information so will probably best enjoy an advisory role. You are also practical enjoying building and renovating things making your work options plentiful. Financially you should not run into too many problems as you are savvy and sensible with your income and budgeting. For an Aquarian the person born on the thirtieth day of January has an even cooler approach to love and romance than usual. You tend to be quite disinterested in teaming up with a soul mate unless someone strongly captivates you in body and mind and tempts you away from your overly work focused priorities. You are sometimes a little too rational to fantasize about romantic meetings therefore your intended partner will be looking for you rather than the other way around. You will require a strong element of friendship and shared interests in any personal relationships to keep you interested. You are also naturally likely to need to feel still independent within a partnership. Emotionally underneath that detached front you can be incredibly loving and caring when committed to somebody that ignites this much warmer side to your nature. Health issues encountered by those born on January 30th may be as a result of your highly active busy lifestyle or your habit of ignoring symptoms. You always seem to be doing something and are likely to consider resting somewhat boring. People born on this day often need to learn more about how their body works and what it requires to function effectively. If this is too scientific for you then exploring holistic theories to better understand your physical and mental wellness. Weak spots to watch out for are problems with lower limbs or circulation and avoiding eating too much red meat is advised. Your main strengths of character appear to lie in your elevated astuteness, organizational skills and social awareness. These positive characteristics and your intelligent rationality allow you make good decisions and achieve success in life quickly. 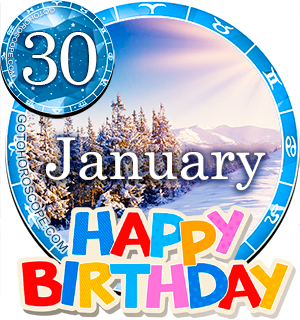 Personality weaknesses that could be recognizable in those born on January 30th are your tendencies to be rather calculating and hard nosed in some circumstances. This negative traits do not surface very often and are almost always in connection with you being particularly angry or upset. Betrayal of trust or big disappointments are common triggers. Being born on the 30th of January usually gives you an unusual view of the pursual and achievement of goals. You have the impression that a conventional goal is something anyone can aim for so you are inclined to make yours that little bit different. It is rare for you to dream of romance and relationships but this does not mean that you do not have a strong wish for emotional happiness. Your dreams and hopes for the future sometimes include your yearning to travel or maybe start your own business. You could also have aspirations to do something worthwhile that will benefit or inspire others. As you were born on the thirtieth day of the month your birth date digits equate to a birthday Root number of Three. The keyword for this numerical natal reference is 'Innovation' and is a possible association to your fondness of communicating concepts. The Tarot card linked to your birthday is the 3rd card in the Major Arcana the Empress. She represents a symbol of your expressive charm, intellect and eloquent mannerisms. An Amethyst is the gemstone specially assigned as the luckiest for January the thirtieth birthdays. Wearing it is thought to strengthen your intuition and attract wealth and good fortune. As an Aquarian in Astrology the ruling planet influencing your personality is Uranus explaining your effective self expression and originality. The actual day you were born on, the thirtieth of January is governed by the planetary forces of Jupiter. This cosmic influence combines with Uranus's and creates your determined acumen and high level of independence and sociability. Your organized, alert and energetic aptitude assists you to accomplish almost anything you set your mind to. If you can soften your aloofness and disinterest regarding affairs of the heart you may also get to know yourself in an alternate light. An applicable concluding thought for people born on January the 30th is that image alone is not everything. Letting others know what you truly want, think and feel emotionally more often should not be seen as weak or too demanding. Jan 30, 1981 baby here This does hit the nail on the head a lot, but also misses a few. For me anyway. Anybody else have the same birthday as me? 13079. Im so everything it describes. Born on January 30 also .,,,haven't met any one else born on this date . Hey everyone is there anyone who was born on the 30th of January born in 1988???? Who has the same exact bday as me??? 1-30-1988????? An Aquarian born on the 30th, I am proud to be me. I have been told that my personallity can sometimes be "too much" for some people, too enthusiastic, too noisy. All my life some people have found my abilities threatening and I have run into people trying to sabotage my career through jealousy. It is so true, that we people born on this day, know our way around words. As a child I won writing competitions, am a telemarketer/lead creator with my own succesful home based business since 2002. I am happiest supporting people, am happy to help others succeed. My business entails sub contracting my skills to real estate agents, which I have also been in the past. Love working alone. A defender of the underdog, I will put my own welfare last to stand up for the under dog or what I think is right. People call me brave. Husband says to suffer my temper is like nothing else! I am very self sufficient and extremely independant and self reliant. I have worked on my sometimes extreme exuberance over my life, now recognising when I need to "tone it down" a bit! I know I sometimes come across as something resembling a "tsunami". I am extremely loyal to those who love me. As a mum, I was a bit of a stickler for rules, expected manners and truth, but also allowed my son to be whoever and whatever he wanted as long as he did not hurt himselves or others, and encouraged his expression. He is a very confident adult, who gives anything a go, learns it backwards and succeeds. I supported and am proud of his self taught Punk drumming which has enabled him to be in bands continuously since 2000! I often dress in a quirky manner, even if only with my accessories, people often stop me in the street to comment on something I am wearing or ask where did I buy that, but at the end of the day I dress for myself. I love art, architecture, renovating, real estate, movies, music, classy clothes, jewellery and accessories. Also love learning, travel and annoyingly analysing people! hence my interest in star signs! I am very complex,my husband tells me. I am an Aquarian born on the 30th. I love my earth day as well. Anytime i meet an Aquarian, it never fails we immediately start vibing. We are misunderstood at times when we dont let people know how we feel. Aloof i can sometimes be. Nine times out of ten, you've done something to be or i just want a moment without you hounding me. Does anyone know what I'm talking about? My Birthday is January 30th 1987. This is somewhat true. Most people think that I am indeed a Leo.. but the good news is that I am born the same day as the King of Spain and the King of Jordan. Mostly on point, but the factors I deal with are more fire like than air like qualities. No pacifistic qualities and always wandering.